30 Jan Design Eye Candy: The Very Best of IDS12 in Photos! It’s true — we say this about IDS every year: it just keeps getting better! This past weekend I grabbed my camera (and my photographer friend, Kelly Lawson) put on some comfortable shoes and lost myself in the latest and hottest trends, products, and creative minds in contemporary design. 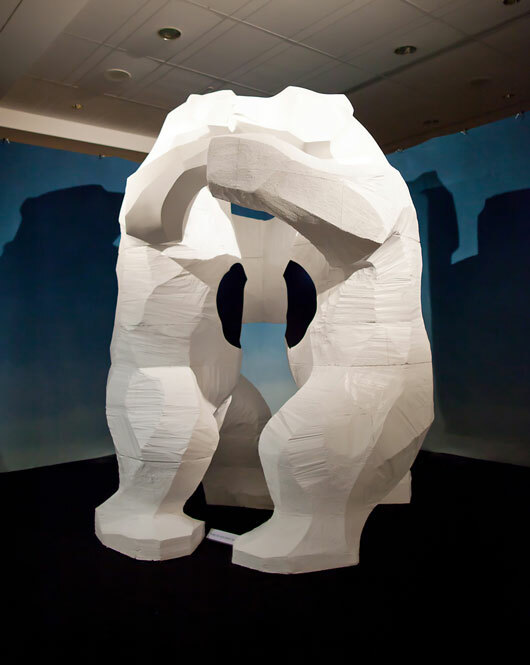 “Ursa Major”, a new installation of larger than life bears, connects art and design to nature. 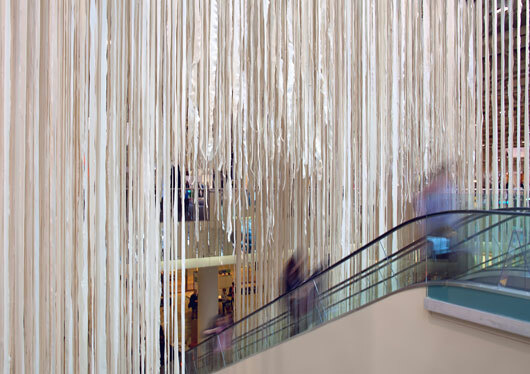 A two-story installation of felt strips cascading from the atrium ceiling gives IDS-goers a dramatic curtain entryway. Its impact is heightened by a superimposed digital projection with which guestscan interact! 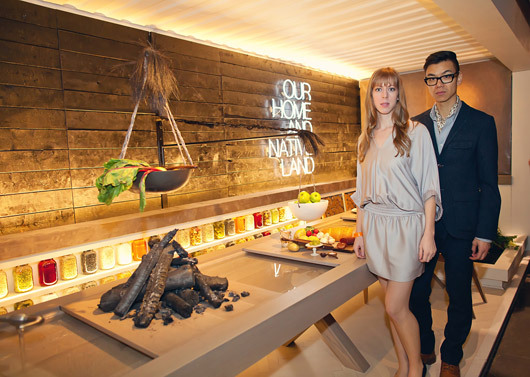 Ashley Rumsey and Stanley Sun of Mason make Canada proud on their interpretation of how to think about the daily rituals of kitchen and bathroom. Stunning, pared-down design, including their own elongated waterfall communal table and neon wall signage. 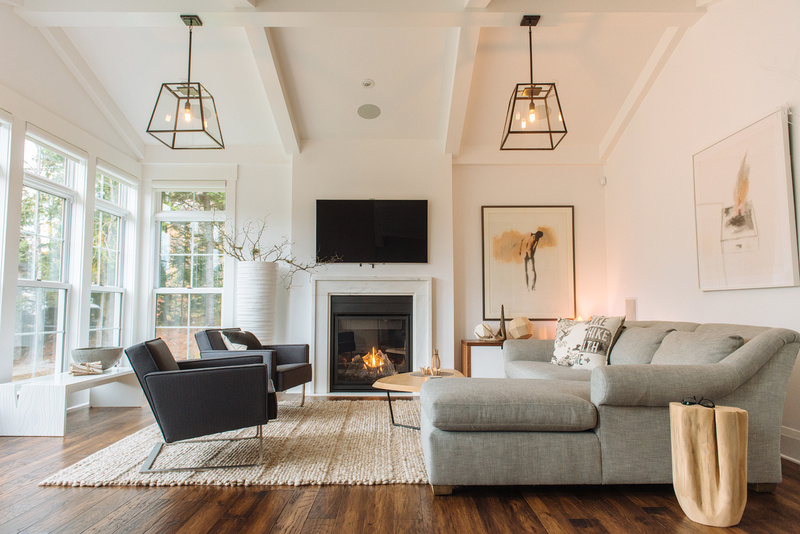 Jill Greaves, an Interior Designer with a history of working with Art and Academic projects, sets her own stage in her small space with beautiful pieces from Thomas Paul, Andy Warhol, and David Weeks. Lisa Canning demonstrating her decor choices. Designer Lisa Canning collaborates with National Bank to put her creative stamp on the problem of transforming a shipping container into a space for work and play. 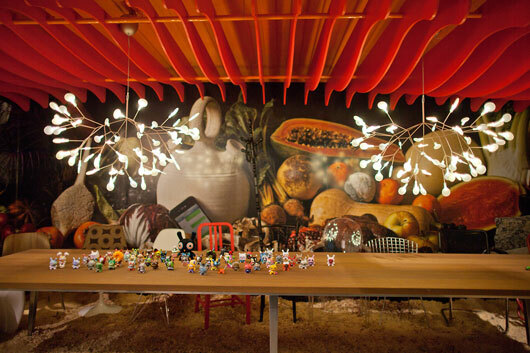 Studio North, the gallery within a design gallery filled with design knock-outs! 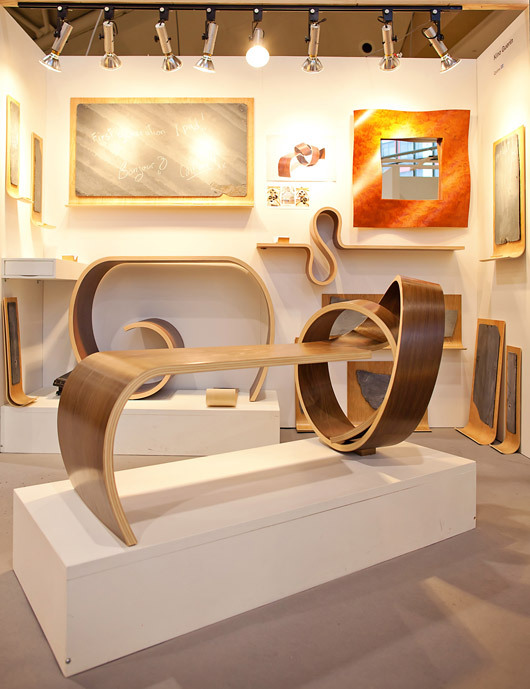 Above is Kino Guérin’s wood creations. This Quebecois craftsperson/sculptor can do things with wood I hadn’t thought possible. He has a real knack for turning wood into…well…something else. Left: Jason Dressler of Brothers Dressler, sitting at his latest table, the wood for which the brothers sourced themselves near their studio. Right: Sculpture of discarded chair legs. The Rollout Team – Canada’s wallpaper sweethearts continue to charm with their latest wallpaper offerings: Wanderlust: Paris Wallpaper Collection. 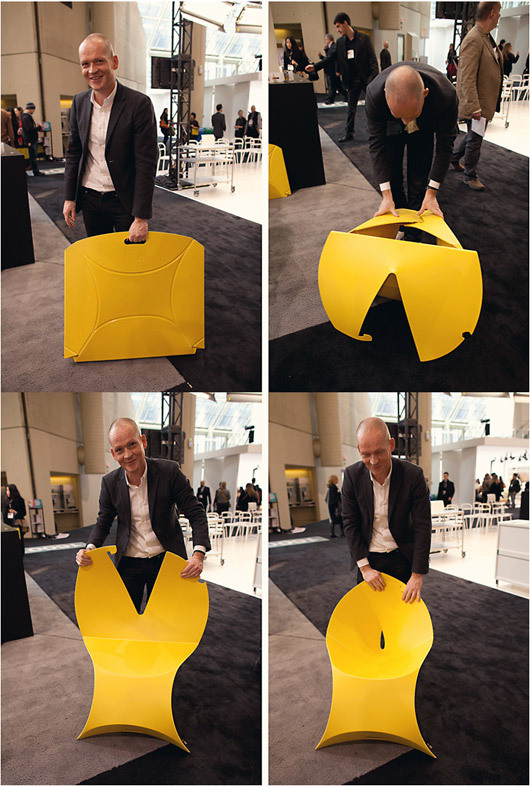 Only the Dutch could, would, and did come up with this genius chair design. 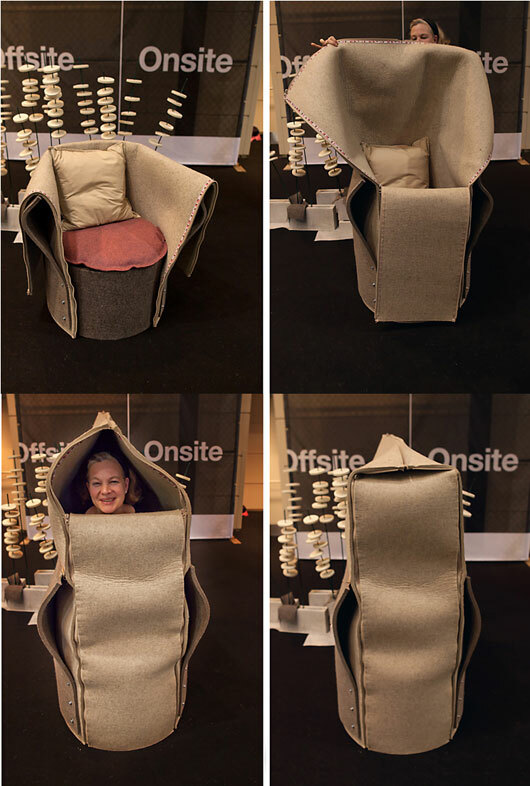 FLUX, now available online in Canada, has created an indoor/outdoor chair that folds from one single piece of durable material, in adult and child sizes. The colors are saucy and the sitting is downright gorgeous! 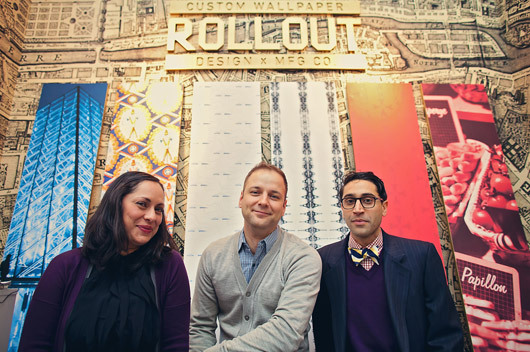 Robyn Waffle, designer and creative director of carpet installation. Think skulls don’t belong on a carpet? Think again. Modallion’s rug designs by Robyn Waffle are anything but wallflowers. 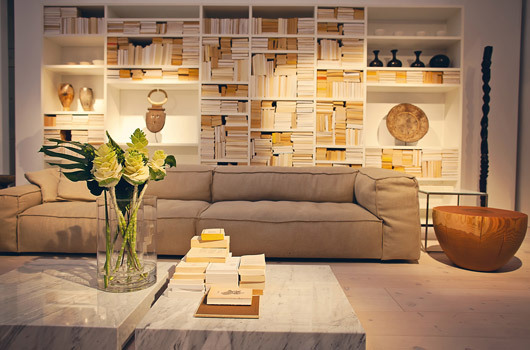 Piero Lissoni is IDS’s International Guest of Honor so I simply could not pass up seeing his space. While visiting we got the inside scoop and were told that at some ungodly hour in the morning before opening day, hundreds of old book covers were torn off second-hand books to create the shelving installation. Not sure if the onerous task was worth it for the designer, but it was sure worth every second of the viewing for me! As was the rest of this year’s turnout of international design talent.